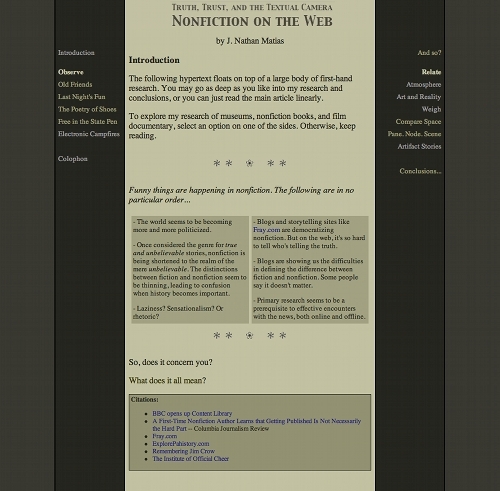 I have mixed feelings towards this hypertext about nonfiction form on the Web, which I presented at Rose-Hulman's 10th anniversary of the Web conference: WWW@10. Looking back, I appreciate its breadth and love its rhetorical innovation. I cringe at the low quality of its analysis. Nevertheless, I can see that creating this paper has profoundly shaped the later development of Philadelphia Fullerine and the World University Project. It also gave me the confidence to work on the Antislavery Exhibit in Cambridge.